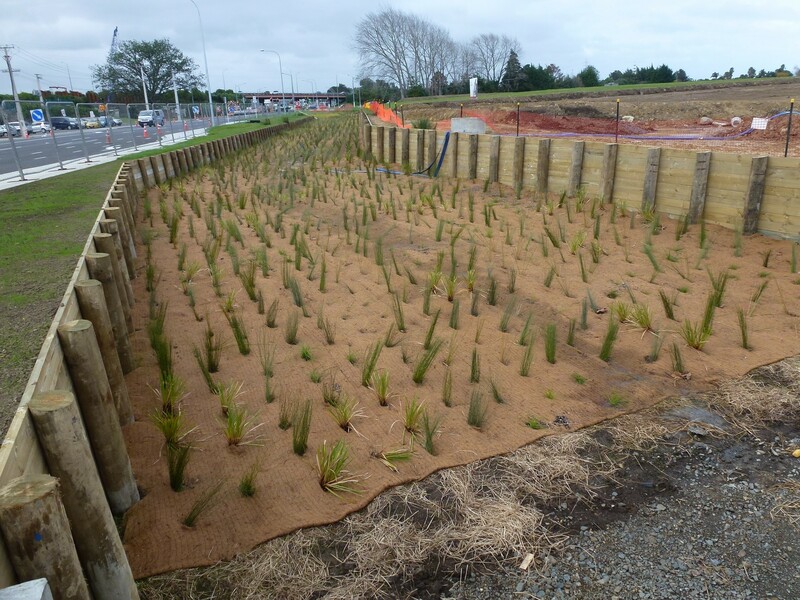 As part of this new residential development an overland flow path, stormwater basin and wetland area had to be protected against erosion as part of the development’s resource consents. As the area is not subject to high velocity flows and the gradients are gentle the project team opted to create vegetated areas to help prevent erosion. However, to prevent loss of soils and help establish grasses and plants in this wetland flow path area Biomac C300 coir fibre matting was installed as an erosion protection mat. Biomac C provides initial erosion protection to seed and young plants from the extremes of rain, wind and sun during the critical germination and development stage. Rainwater runoff is considerably reduced with more water retained in the soil to further assist vegetation to germinate especially in dryer climates. In addition, the natural decomposition of the coir (coconut fibres) provides some enhanced soil fertilisation. A popular product used in landscaping applications Biomac C products are easily installed via ground pinning and provide a quick and cost-effective erosion control solution.